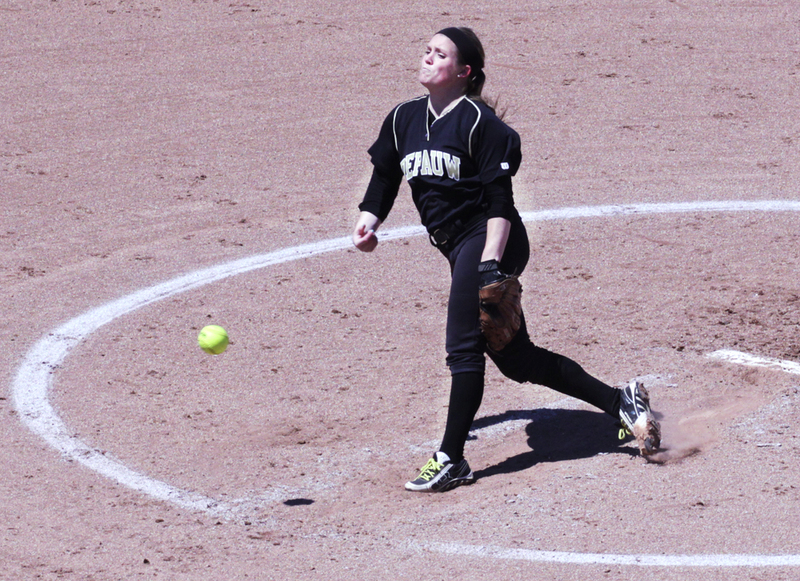 Senior Kahla Nolan pitches during a game agianst Wooster College on Sunday. home game against Denison University on Friday at noon. It’s not often that a softball pitcher goes 11-4 with a 2.11 ERA and punches out 142 batters while playing with an 80 percent torn ACL. Yet this is the case for first-year Emma Baldwin, who has had to deal with the injury since August. Baldwin is only one of the many bright spots in the Tiger’s pitching staff, which has been lights out this season, carrying a team ERA (earned run average) of 2.92 and a 1.40 ERA in conference play. Much of Nolan’s personal success has come from her pinpoint control. Nolan has also had to deal with her fair share of setbacks. Having been a Type-1 Diabetic since she was nine, Nolan has often had to take time out of practice to fix her blood sugar. On top of this, Nolan has also been dealing with a forearm bruise that developed after the team’s games against Franklin College in mid-March. “We think that it came from the contact between my arm and hip at the release point in the pitching motion,” Nolan said. Nolan and Baldwin have developed a special bond that’s helped them both on the mound. Last season, Nolan accounted for almost all the innings pitched for the team. Baldwin’s emergence has helped lessen the workload for her. “The relationship is, ‘thank goodness I have you’,” said Hanrahan. It also helps that Hanrahan was a pitcher in college and works as a specialized pitching coach. Nolan and Baldwin have become the team’s one and two on the mound over the course of the season. With Nolan and Baldwin starting most games and combining for over 127 innings, Hanrahan often turns to first-year pitchers Bekkah Roberts and Kaitlyn Holden to come in to relieve the two workhorses. “The fact that we’ve got KJ [Kaitlyn] and Bekkah to use if anywhere something happens, we are…confident with them,” Hanrahan said. “They’re ready to go…It’s a good comfort zone to have if something happens with [Nolan and Baldwin]. Out of the four pitchers, Roberts has the lowest speed, specializing in off-speed pitches. As a southpaw, she’s brought in to face left-handed hitters in certain situations. “I give a different look to throw batters off balance,” Roberts said. Holden also comes in to change things up for batters, who are use to seeing the high velocity that Nolan and Baldwin bring. This weekend, the team will open up North Coast Athletic Conference tournament play against Denison University (19-17) with a 27-12 record. Expect the pitching staff to play a big part in carrying the Tigers through the tournament.